This article, written by Victor Sostak, specialist on Carpatho-Rusyn folk instruments and a curator at the Uzhhorod Historical Museum, is the second in a series an folk instruments. A large gray tempestuous cloud covered the sky. The mountain, covered by a forest of fir-trees, was still, waiting for the storm. A few sporadic raindrops fell out of the gray sky, pounding the rooftops of the Verchovyna village. Suddenly the sky was illuminated by lightning and a loud clap of thunder was heard. "Hurry up," Petro said to himself as he put on his cap and rubber boots. He quickly grabbed his axe and went to the mountain. The old master craftsman went through the forest looking for the wood that was to become his cymbaly. He was hunting for a tree with resonant wood - a white maple, beech, or hazelnut that had matured while standing in the path of the wind and had been warmed by the sun. A tree that had been struck by lightning (hromovicja) was considered to be the best choice. He was in a hurry to find the tree. Streams of rainwater covered his face. The soft ground clung to his boots, making them very heavy. Climbing up the hill was difficult. He had worked in the lowlands and had seen the misfortune and suffering of his people. He had always dreamed of making the instrument that could help make a difficult life happier. He made his first cymbaly when he was a boy. He always smiled when he remembered that cymbaly. Now he was a well-known craftsman. Many musicians and ensembles wished to own a cymbaly made by his hands. He had made so many cymbaly -- the Verchovyna harmonic and rhythmic cymbaly, the Hutsul cymbaly, and the large chromatic cymbaly. The Verchovyna cymbaly is very popular in the Mizhirja and Volovec' districts. This trapezoid-shaped instrument, measuring 50 to 70 centimeters in length and 25 to 30 centimeters in width, is light, portable, and produces a resonant sound. A group of three strings is called a bunt. There are six bunts on each side of the cymbaly. Each bunt is divided in the middle and supported by a specially carved wooden bridge called a kobylka. The bass strings do not have a kobylka. The sound is produced by striking the open strings with balcaty (mallets made of maple or thornwood). 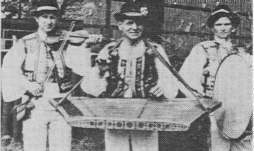 In the popular musical trio Trojisty Muzyky, the Verchovyna cymbaly adds harmony and rhythm to the musical sound, and sits between the husly (violin) and the baraban (drum). The Hutsul cymbaly, popular in Transcarpathia, comes in two sizes -- large and small. The small Hutsul cymbaly has ten bunts with three strings each. The bass strings, having two or three bunts with two strings each, are tuned in octaves. The other strings have a diatonic, or major scale order, and are limited in their tonal possibilities. The large Hutsul cymbaly is capable of performing all of the musical functions in the orchestra. It can play melody, rhythm, or harmony, and gives the best tonal foundation for the orchestral sound. The Verchovyna and Hutsul cymbaly are used at a number of special occasions, such as the traditional wedding procession and the farewell to the shepherds as they leave for the polonyna (high pasture lands). On these occasions, the cymbalist stands while playing. A belt is connected to each side of the cymbaly and rests across the player's neck and shoulders. During a dance or a concert, the cymbaly rests on the player's knees. The cymbalist uses the palm of his hand to stop the strings from ringing at the end of the musical phrase. The Hungarian chromatic cymbaly (sundivs'kyj cymbaly) is larger than the other two types. Each bunt has groupings of either two, three, or four strings that have the same pitch. This cymbaly has 35 bunts. The strings progress chromatically for three octaves. The variety of cymbaly, the long tradition of folk performance, and the degree of craftsmanship needed to make the cymbaly all attest to the high musical culture of our Carpatho-Rusyn people. Yet, there was a time when folk instruments were not allowed at public performances. Now, the cymbaly is played throughout Transcarpathia in folk orchestras, and there are classes at musical colleges and schools for those who wish to learn how to play this instrument. The tree which Petro had sought for so long suddenly came into view. The lightning bolt had split the tree from top to bottom. Petro touched the middle of the tree; it was still warm. With a feeling of anticipation, he tapped the tree with the handle of his axe and was thrilled by the results. The tree came back to life and the tapping sound resonated from the wood. He began to chop at the tree with his axe, but it would not be cut from the side. He had to pull the pieces toward himself, following the fibrous pattern of the wood. On the table, there rested a new cymbaly whose color was a beautiful orangebrown hue. The sun's rays entered the room and were reflected from the polished surface of the wood. Petro, the craftsman, took his mallets and struck the silver strings and a charming melody resonated from the instrument.